Countersync fabricates and installs solid surface countertops and solid surface showers in homes, offices, schools, restaurants, and hospitals throughout the CSRA, including Thomson, Waynesboro, and Aiken. Unlike other countertop and shower companies who carry stone products like marble, granite, and quartz, Countersync has chosen to work solely with solid surface material because we believe it best serves the needs of local customers. Countersync is unique by design because solid surface brands like DuPont Corian and LG Hi-Macs are available in a wide range of colors, patterns, and profiles that make it easy to customize your space. Solid surface is ideal for use throughout the home and business, the possibilities are endless! By working with such a high-quality product, Countersync can offer a more durable, beautiful, and low maintenance surface without sacrificing quality of craftsmanship or your vision for your space. Countersync's most common residential projects include bathroom vanity countertops, kitchen countertops, and custom-made showers. Commercial projects Countersync has completed include office kitchens, hospital bathrooms, front desks, ticket counters, and work surfaces everywhere from dental offices to marketing offices. Countersync's custom made, walk-in showers are especially great in commercial construction because of their shorter install time and the labor saved due to their shorter cleaning time. When you're ready to get your project started, visit our showroom, call us, or use our Request A Quote feature! 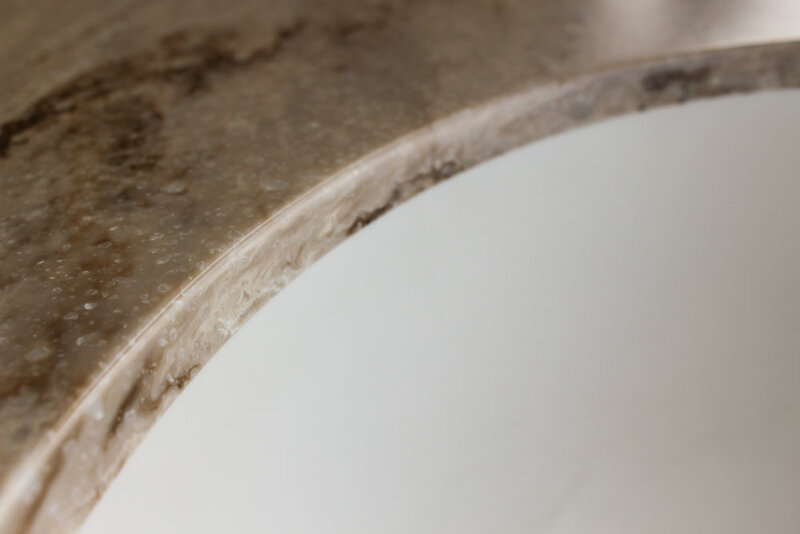 Unlike stone products, solid surface showers and countertops are nonporous and completely seamless. Learn more about cleaning and maintenance. Solid surface is the most versatile material for showers and countertops. Choose your options for a custom design. Solid surface is the first choice of hospitals, clinics, and independent medical professionals because it is completely nonporous and is seamless after installation. Learn more about the benefits of solid surface. The color options are many between the different brands of solid surface. Browse your color options. From the moment you call or visit our showroom, we provide you with superior customer service and attention to detail. Our fabricators and installers are the most professional and courteous in town. We understand that renovations are a huge undertaking, and we aim to make your experience with Countersync as seamless as our countertops and showers. We understand that it takes a lot of trust to invite someone into your home to complete a project. We will treat your home as if it were our own, complete your project in a timely manner, and leave the area spotless when we're done. We pride ourselves on punctuality, and we will respect your home and space.